On the very day that our God given Declaration of Independence was signed, a committee consisting of Dr. Benjamin Franklin, Mr. John Adams, and Mr. Thomas Jefferson was appointed to prepare a National Seal for the newly born republic. In the New Testament, a seal has a deep spiritual significance, for Paul had written, “You were sealed with that Holy Spirit of Promise.” (Ephesians 1:13) Thus, in our national life, the seal stands for the vital and far reaching things for which a nation has been brought into existence: it’s history, it’s ideals, it’s destiny. Design after design was submitted and there was meeting after meeting, as artists and others were invited to contribute their ideas. Everything that was remotely relevant was examined, yet the present seal was not formally adopted until June 20, 1782, which was at least five years before the Constitution was adopted. The Revolutionary struggle, with it’s great sufferings and loss of life had thrown the Colonies back upon God, so that more and more they had become spiritually conscious of the destiny that was shaping their ends; hence they naturally turned to the Bible for their heraldry, which might express their great struggles, their solemn obligations to God, and their high ideals for their Nation. Few people know that both sides were designed and adopted at the same time. From very ancient times double seals were used as a sort of double check perhaps from the idea employed that two witnesses are required in deciding the case. On the obverse side of the Great Seat is the Flying Eagle; on the reverse side is the Great Pyramid of Gizeh. The Eagle in full flight, has its head turned westward, for westward it has always taken it’s way. This is in historic keeping with the little group of colonists who landed on the Atlantic seaboard, and have traveled westward to the western ocean, settling the great wilderness of North America. Thus the Eagle is made a National Emblem by God in illustration of His dealings with His people. The colors of the stripes on the shield are reversed from the order in the flag. The flag stripes begin and end in red, while the Shield begins and ends in white. The flag represents the active policy of the Nation while the Shield represents the underlying motives. The purity of the motives is best represented by the white. The scroll in the Eagles beak is unrolled that the world may know who the Eagle nation is. They have unfurled the Scriptures upon which our constitutional law is based, that the world might see their reliance was upon God. The Flying Eagle can only mount to celestial heights when borne upward on the pure white word of God’s Truth. The motto “E Pluribus a Unum” means “One From Many.” All the states, which make up this nation, are each distinct and yet each bound into a common weal, or a Commonwealth! The arrow is declared to be the weapon of the Almighty, Deuteronomy 32:23, “I will spend Mine arrows upon them.” 2 Samuel 22:15, “The Lord sent out arrows, and scattered them.” The arrows in the sinister claw of the Eagle symbolize preparedness and readiness to protect the nation from the attacks made upon it. Peace is the great objective, but the arrows of the Almighty protect His nation, and maintain its Peace. Pacifism has no place in the heraldry of the Great Seal of our Nation. The number 13 is predominant in the Bible account of the nation of Israel. Although Jacob (Israel) had 12 sons of his own which were later developed into the 12 tribes of Israel, yet out of the birthright tribe of Joseph was created TWO separate tribes in place of one. Because Joseph was separated from his brethren while in Egypt, his two sons, Ephraim and Manasseh were adopted by the old patriarch Jacob (Israel) creating each of them into a separate tribe, Genesis 48. So actually there were 13 tribes of Israel, The number 13 is predominant in the heraldry of the Great Seal as well as air through the history of the United States. 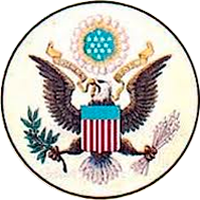 On the seal there are 13 olive leaves, 13 olives, 13 arrows, 13 paleways in the shield, 13 letters in “E Pluribus Unum,” and 13 stars. The Crest over the eagle’s head is composed of the Glory breaking from the Clouds, shining upon 13 stars. A pillar of fire and cloud led Israel through the wilderness. It is marvelous indeed that this nation; as Israel of old should place above the eagle’s head this symbol of overshadowing Divine Glory, showing that God is leading this nation to it’s glorious destiny through it’s wilderness journey of struggle, failure, sorrow, and sin to ultimate victory! In Israel history, during the 40 years of wilderness wandering, the cloud never left them nor can we believe His Presence will ever leave our nation. The constellation of 13 stars is the blazing pointers to grand and noble truth, just as the star in the East that led the Magi on to the manger of the Baby Jesus. The Stars are His celestial lights and they are to shine into a world of darkness. God has chosen America to be a light to the nations. 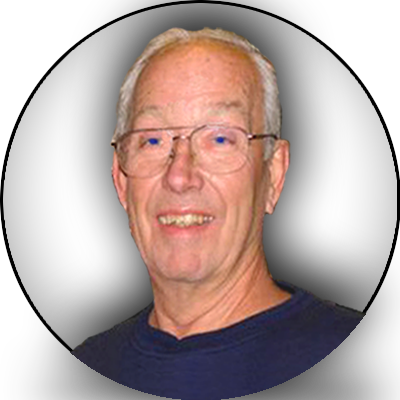 The reverse side of the Great Seal has a distinct message for us in this unusual period of our history through which we are going. The heraldry carries a great message, a “Great Pyramid” unfinished. In the zenith an eye in a triangle, surrounded by a Glory proper. 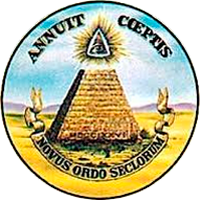 On the base of the Pyramid are letters MDCCLXXVI (1776), and underneath this motto “Novus Ordo Seclorum.” Thus reads the legal enactment with 13 tiers of stone, the symbolism of being left unfinished, signifying as yet an unrealized program. “I will guide thee with MINE EYE.” Psalm 32:8 The EYE is set in a triangle that represents the Father, Son and Holy Spirit and proclaims our national belief in them. Also is presented the truth that America is the Stone Kingdom of Daniel 2:44. The triangle is also symbolic of the Capstone, which is being lowered from Heaven upon the top of the unfinished Pyramid amidst the same Glory through which the 13 stars are seen to burst in the crest over the eagle’s head. Evidently the symbolism indicates that the nation will never completely fulfill it’s destiny until the Stone which the builders rejected is become the “head of the corner.” This is what Jesus was referring to in His parable of the Wicked Husbandmen (Matthew 21:42). Here, on the Great Seal our most priceless possession, is engraved the message of the return of our Lord Jesus Christ!